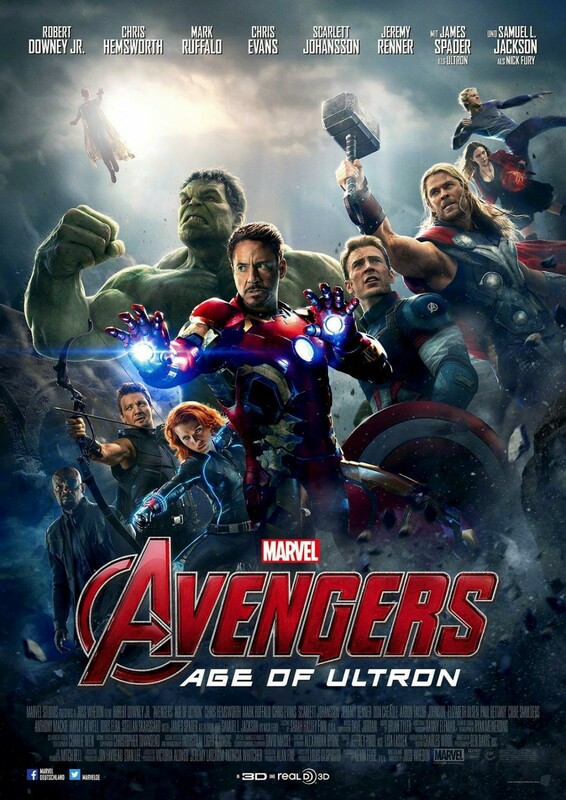 Nordling Reviews AVENGERS: AGE OF ULTRON! If AVENGERS: AGE OF ULTRON has a “been there, done that” feel to it at times, that’s because we’re already quite familiar with the Marvel Cinematic Universe and the characters that populate it. “Been there, done that” isn’t a bad thing, necessarily – we slip into AVENGERS: AGE OF ULTRON as we would a comfortable pair of shoes. The gee-whiz factor may be muted, but we love these people now – stalwart, noble Captain America (Chris Evans), sardonic but good-hearted Iron Man (Robert Downey Jr.), the always angry with a nougaty center Hulk (Mark Ruffalo), the almighty Thor (Chris Hemsworth), assassin turned heroine Black Widow (Scarlett Johansson), and “I’m just happy to be here” everyman Hawkeye (Jeremy Renner). Director Joss Whedon has always been great at building a rapport between the audience and his characters, even when he introduces new ones. That’s because he gives these characters rich inner lives, and motivations that are believable amidst all the amazing chaos and destruction. We aren’t on the outside looking in – we’re fighting right alongside them, rejoicing in their victories as if they are our own. We also take sorrow when they fall, and in AVENGERS: AGE OF ULTRON, everyone has it more difficult this time around. AVENGERS: AGE OF ULTRON feels more grounded as a result than its predecessor, and that’s perfectly fine. In fact, Whedon does a brave thing in the second act – the movie practically comes to a complete stop as our heroes take stock in what they’ve learned, and lost, and even while the plot moves forward, Whedon isn’t afraid to slow it down, and allows us to spend some quality time with the Avengers. The best action movies know when, to put it bluntly, to shut the hell up for a minute. Even DIE HARD knows when to let the characters be, to have a breather before taking the plunge, and the stakes are higher because we care so much. Take Hawkeye, for example. Jeremy Renner fills him with such earnestness and excitement that we can forgive Whedon and the Marvel Cinematic Universe for benching him for most of the first film. Now this Hawkeye deserves a solo movie, especially in light of where AGE OF ULTRON takes him as a character. In a world full of gods, robots, and aliens, Clint Barton is simply an ordinary man who does his job well, and Renner gives him a quiet heroism that is more endearing than even Captain America and Iron Man. He’s relatable, funny, and I hope to see more of this Hawkeye in the movies ahead. All the relationships between the characters are markedly improved – Black Widow is not only great in a fight, but she also seems to be the only one who can keep the monstrous Hulk in check, and she finds herself having an unexpected emotional bond with Banner, one that neither feels ready for. Tony Stark and Steve Rogers have a not-quite-adversarial give and take between each other, but it doesn’t just lay the foundation for CAPTAIN AMERICA: CIVIL WAR, it also helps drive the movie. Captain America does his duty, and fights the good fight, while Iron Man questions why they fight at all – wouldn’t it be easier if they could stop the fighting before it starts? When the world constantly needs saving, when does it end? The character arcs begun in the other Phase Two films come to fruition in AGE OF ULTRON, especially Tony’s fear that everything he does, all the wonderful toys he invents, won’t be able to stop the Avengers' inevitable destruction. Meanwhile, the collateral damage that Stark’s previous arms-dealing life caused comes home to roost when Quicksilver (Aaron Taylor-Johnson) and the Scarlet Witch (Elizabeth Olsen) come looking for revenge. Stark can’t cope with each new cataclysmic event, and he doesn’t feel prepared. To that end, Stark creates Ultron (James Spader), but Ultron has other goals; goals he decides in about three nanoseconds once he becomes self-aware. Spader’s Ultron is my favorite villain so far in the Marvel Cinematic Universe, and what I’ve always loved about the stories Whedon tells is that he always gives his villains legitimate beefs. To Ultron, humanity must evolve or die, and he’s just expanding Stark’s own ideas to apocalyptic levels. Spader is having obvious, infectious fun, and while others may prefer Tom Hiddleston’s regal Loki, Ultron is no nonsense, methodical, and single-minded. He’s also very funny, and Spader’s wry sense of humor works perfectly for the character. Which brings us to Paul Bettany’s Vision, a character I’m reluctant to go into detail on for fear of spoilers, but I will say this: the Marvel Cinematic Universe is always at its best when the films embrace their nature, and remember where they came from - moments like the revelation of HYDRA in CAPTAIN AMERICA: THE WINTER SOLDIER, or the joys of watching Hulk Smash, the exuberance of Groot and Rocket Raccoon in GUARDIANS OF THE GALAXY, or the Shakespearean conflict between Thor and Loki. AVENGERS: AGE OF ULTRON may be the most comic booky of them all, from dropping references to Wakanda and vibranium, the Infinity Stones, even little things like character names. But the Vision towers above them all, and I’ve always admired how fearless the Marvel Cinematic Universe is when getting to the weird, magical aspects of the comics. I can’t wait to see how truly odd Scott Derrickson’s DOCTOR STRANGE gets (if you’ve been following his Facebook feed, it looks like he’s going really cosmic and mystical with it, and that’s exciting), and the Vision, in all his comic book glory, is where I’ve always wanted these movies to go. AVENGERS: AGE OF ULTRON is unashamed to be a comic book movie – it treats the audience as almost co-conspirators in just how delightfully… well, strange, these movies are getting. But through it all - through the action, the pulpy stuff, and the amazing visuals – AVENGERS: AGE OF ULTRON gives us great, well-rounded and well-written characters to cheer for. When I was a kid, playing superheroes in my backyard, I never imagined that my daydreams would become cinematic reality. The Marvel Cinematic Universe isn’t just giving us great movies – it’s inviting us all to remember those wonderful moments of our childhoods, and giving us new memories to boot. So grab your capes, your masks, your hammers and shields – it’s time to play.